It has been a month of disappointments, beauty-wise; face creams that didn’t cut the mustard, shampoos that ended up in the charity pile and a weird waterproof-mascara-remover that looked like an actual mascara (you brush it on from root to tip and leave the oils to dissolve your makeup) but failed to do the job on my lashes both times I tested it out. Sigh. So finding my favourites has been rather labour intensive – there have been dozens and dozens of rejects for every good discovery – and a couple of this month’s featured products are actually not that new. 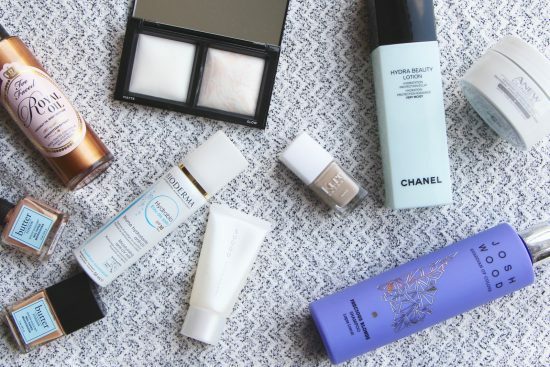 The Suqqu Moisture Mask, for example, which has bulldozed its way back into a favourites video due to its sheer magnificence in the hydration department, and the Nail Tinted Moisturisers from Butter London, smart little low-key polishes that I’ve been using for quite a few months. But my round-the-clock beauty testing has paid off (ha! oh the dedication) and there are a few proper gems in this video that I know I’ll be using for years to come. The lightweight Hydra Beauty Lotion from Chanel is a sort of essence-serum that really gives a brilliant moisture boost – you’ll be sick of hearing about by the end of the week, because it’s in tomorrow’s post as well. The Royal Oil from Too Faced is new to me but has gone straight into the drawer for must-have body-finishing products. It’s holiday skin in a bottle – glowy, gorgeously scented and with just a hint of a tint, excellent for adding polish to legs and arms.